Since its founding in 2005, the Boycott, Divestment and Sanctions (BDS) movement has targeted Israeli universities, businesses and cultural organizations. Most recently, its efforts against Israel’s music scene has been in the headlines more than usual…writes Shiryn Solny/JNS. 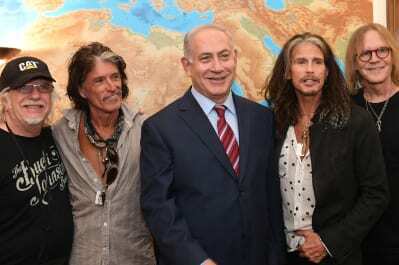 Israeli Prime Minister Benjamin Netanyahu meets with members of the rock band Aerosmith at the Prime Minister’s Office in Jerusalem on May 18, 2017. Photo by Kobi Gideon/GPO. The chatter circulated around American singer-songwriter Lana Del Rey, who was attacked by BDS supporters for agreeing to perform in September at the Meteor Festival in Israel, a decision she originally defended to a great degree on Twitter with a lengthy statement on Aug. 19. The “Summertime Sadness” singer said at the time that “music is universal and should be used to bring us together,” and that her “plan” was for the concert to be done with “a loving energy with a thematic emphasis on peace.” But after facing a tremendous amount of pressure to call off the show, Del Rey did just that on Sept. 1, a week before she was scheduled to perform, and said she will reschedule when she is able to play in “both Israel and Palestine.” Afterwards, 15 or so other artists also cancelled their performances at the Meteor Festival. “What [Lana] didn’t understand was that she’ll never get to play for Israelis and Palestinians because [BDS co-founder] Omar Barghouti will make sure that if someone books Israel, they cannot play any venue over the Green Line,” said Aviva Miller, the New York regional director for Creative Community for Peace (CCFP), an advocacy group comprised of prominent members in the entertainment industry who are “dedicated to promoting the arts as a means to peace and to countering the cultural boycott of Israel,” according to its website. The organization is in no way funded by the Israeli government or backed by any institution in Israel. As CCFP’s New York director, Miller—an entertainment attorney by trade—is focused on cultivating a group of supporters and creating a “community” in the New York area of those who believe in combating the BDS movement, including entertainment-industry executives, agents, managers, owners of entertainment corporations, members of the Broadway and theatrical world, and those in film, independent film and television. New York City and its surrounding areas account for 40 percent to 50 percent of the entertainment industry in the United States, she said. It was the CCFP who helped Jewish actress Scarlett Johansson in 2014 when she was barraged with requests from BDS supporters to cancel her contract as the global brand ambassador for SodaStream, an Israeli carbonated-beverage company. Johansson’s publicist and manager turned to CCFP and asked for assistance in creating a narrative that allowed the actress to defend her decision to maintain the endorsement deal despite facing pressure from the BDS movement. “What they’re doing is extremely irrationally and emotionally charged, and not based in reality,” Miller said about tactics used by the BDS movement. More artists perform in Israel than not, and among the musicians who lit up the stage in Israel this year were Jason Derulo, Flo Rida, The Backstreet Boys, Enrique Iglesias, Ringo Starr and Ozzy Osbourne. Last year’s performers included Boy George, Britney Spears, Aerosmith, Rod Stewart, Guns N’ Roses, Justin Bieber and more. The British rock band Radiohead played in Tel Aviv in July 2017, despite a major campaign from BDS supporters that garnered headlines. Its lead singer, Thom Yorke, attacked BDS activists in an interview with Rolling Stonemagazine. This year’s Meteor Festival ended up being a major success and had nearly 130 artists in the final lineup. CCFP’s direct communication with artists Pusha T and Kamasi Washington helped ensure that they perform at the Meteor Festival despite facing BDS pressure, Renzer told JNS. Miller said the BDS movement uses a tactic of overwhelming artists with their demands, and attacks to the point where some musicians will just give up and give in to BDS demands. Activists also use social media to make direct contact with the artists, and on top of everything, the BDS movement spews a false narrative about Israel that many artists believe because they are uneducated about the truth behind the Israel-Palestinian conflict. The CCFP works to combat all those elements. But Miller explained that the BDS movement has “no business” even getting involved in Israel’s cultural activities. Culture should “transcend anything that’s relevant to politics,” she insisted, and such boycotts only hurt the artists who miss out on performing for their fans, and his or her fans who are not given the opportunity to see their idols in concert. Miller urged people not to be silent about their support for the Jewish state. She said CCFP does not attack BDS activists; rather, the organisation focuses on defending and countering the negativity they are creating—and that is what needs to be valued, supported and lauded. The next major cultural event set to take place in Israel is the 2019 Eurovision song contest, which Israeli singer Netta Barzilai won this yearwith her catchy hit song “Toy.” Israel confirmed earlier in September that the competition will be held in Tel Aviv. Miller expects BDS supporters to make a commotion about it.